Our today’s post is specialized for those who have an android mobile phone or an android tablet and want to download videos from youtube in order to play them later on. No doubt, YouTube is the best and ever best place for uploading and streaming videos online. Lots of people from all around the world are using youtube. They may use it just for streaming and watching their favourite videos or may upload their latest and new-made videos to youtube. But here suppose that you have an android mobile phone and you want to save video from youtube to mobile because you want to play it later on your phone without accessing the network and internet. So If that is the case then you are arrived just in the right place because in this how-to post we’re going to discuss that how you can download youtube videos on android phone. After reading this descriptive tutorial, you will be able to do so. 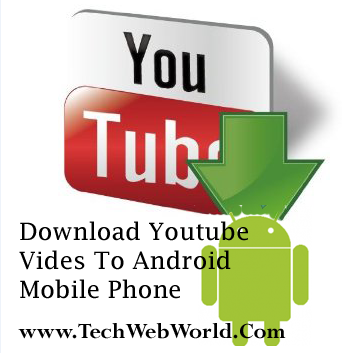 Well, here is the answer and solution for your question “How I can download youtube videos to my android phone?”. Throughout this post, we will be discussing two methods for downloading youtube videos to your mobile phone. In first method we'll be using apps for this purpose there are two apps we're recommending to you and the second is to use free web-apps. So let have a look. I think you may already be aware of this best tool for your android which is more popular, but if you don’t know about this then I would like to prefer this tool to you in order to download youtube videos to your android mobile phone. TubeMate is a great and powerful tool having the ability to browse and download youtube videos on your android device. Using TubeMate App on your android mobile phone, you don’t need to search for a video on youtube or any other browser but you will have to directly search for the video which you want to download to your mobile phone device. After finding a video, you will see a download button (A green colour down-word arrow) below so click on it, and select the appropriate video format you want to save in.You can Download Tubemate from its official website. After making a research, I found this application useful so decided to add this one to our post. wontube is an android app which enables you to download youtube videos to your android mobile phone. So you will be able to play youtube videos on your mobile device even if you’re offline. Web-based apps are here letting you to download videos from any of the video sharing websites easily. But some web-apps are built for computer’s so these may not work properly on mobile devices, but still there are some tools like MakeJar etc which let you download youtube/facebook or dailymotion videos easily to your mobile phone device. MakeJar is a web-based application which is specially build for mobile users and it uses a user and mobile-friendly interface. Unlike the others it does not uses flash-based interface which makes the downloading a video either from youtube or any other video streaming website possible directly on mobile phone. If we talk about the output quality of the videos you’re going download using this tool, you’ll have to select your mobile device so the video format will be compatible with your device. It has listed all of the Nokia phones, Iphone, Ipod, Samsung, HTC and many more. 1) Select your device from the dropdown list. 2) Copy and paste the link of the video you want to download. 3) Select the output quality i.e Low, Medium or standard. 4) Click download and that’s it. Note: After clicking on download button wait for a moment and reload the page so your download will be ready after conversion. Keepvid supports almost every video streaming site to download video from, by providing the link of the video. The process of downloading videos using this tool is easy and is worth pasting the video link in the box provided and then clicking on download button (will be there in the orange colour).